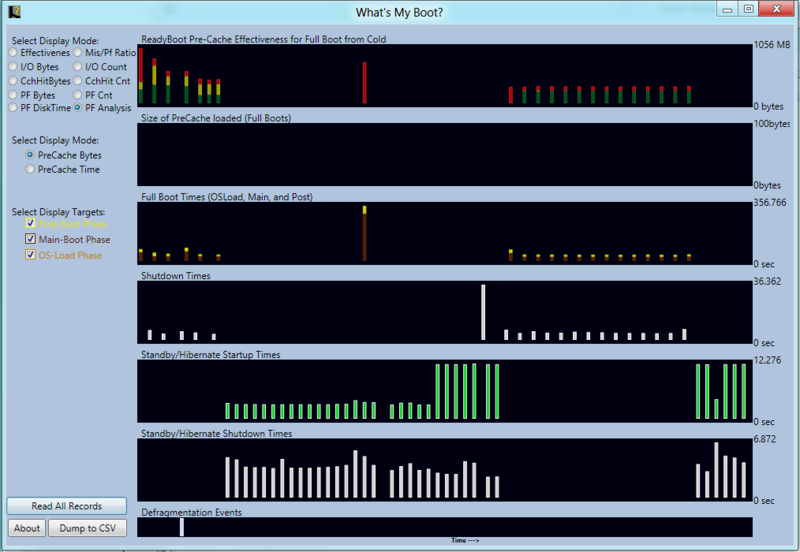 WhatsMyBoot is a tool to analyze the data left behind from booting your operating system. In particular, it analyzes the results of ReadyBoot, an OS feature to improve boot performance. Ready boot (not to be confused with Ready Boost, which is a USB thing) will typically reduce boot times from 30 to 10 seconds. Open the Zip file and run the exe. There is no installer. When Ready Boot is enabled (which it is by default on Windows 7/8, and many Windows 10 systems), the OS measures file read performance during the boot phases. About 180 seconds after user logon, this data is flushed out to the disk. This data is used during the next boot to cause prefetching of needed files before the CPU requests them. Typically, after about 5 boot cycles, readyboot is about as good of optimization as it is going to get. Run the tool and ask it to analyze this data. The middle chart, "Full Boot Times" is the primary chart of interest. It shows the durration of up to the last 60 boots. The top chart provides a more detail analisys of the Caching effectiveness of ReadyBoot. The other charts show different scenarios that are also recorded. Note: If you are using SSDs and see defragmention events, you probably want to turn that off! WhatsMyBoot is free to use.